Lital Villa is located at the end of the road in a very quiet neighborhood. The rooms are big and gorgeous, and the surrounding views don’t hurt either! Villa Lital offers seven bedrooms set on three levels, with various terraces and decks throughout the property. The Quartier-du-Roi location places the villa a few miles from Gustavia’s boutiques and restaurants and Flamands Beach. The infinity pool is surrounded by a wood deck with several loungers and a wet bar. Views of the Quartier-du-Roi hillside and bay surround the villa, and the abundance of glass walls and sliding doors allows these views to be seen from the living and dining areas, stairs, and bedrooms. Two well-manicured lawns adorn the grounds as well. The main living and dining areas are on the same level as the terrace and pool. One fully-enclosed living area offers air-conditioning, while the second living area is adjacent to the pool open to the ocean view. The floor-to-ceiling glass doors can be fully opened or closed off, and the large gourmet kitchen opens to the wet bar outside the pool. Behind the living room, a separate bungalow holds the master bedroom and it’s king-size bed, dressing area, ensuite bath, outdoor shower, and small private terrace. Between the living and dining areas, a stairway leads down to the other bedrooms. The middle level has two bedrooms, each with a king-size bed, dressing area, ensuite bath, and patio access. The lowest level holds four smaller bedrooms, each with twin beds with the option for a king and an ensuite bath. The villa has beach access for snorkeling, surfing, or walking with water shoes. 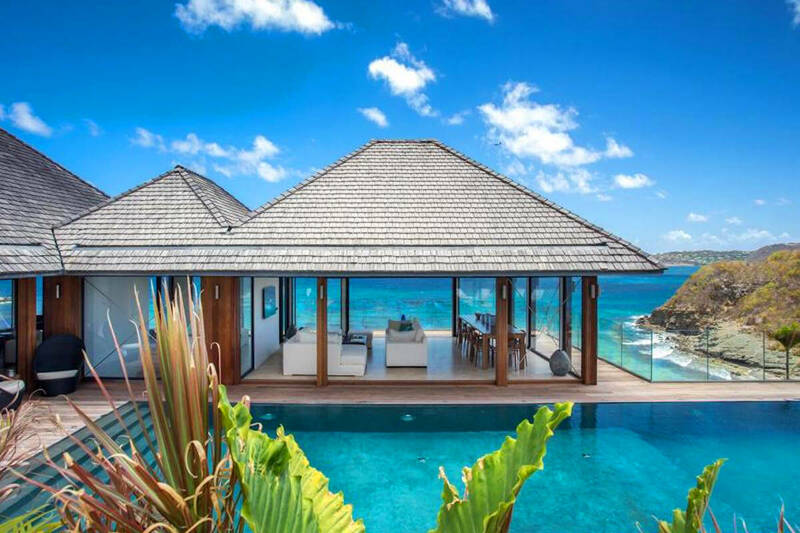 This villa is private and close to Gustavia, bringing convenience and intimacy to your next St. Barth vacation.